C/No is the Carrier to Noise ratio sometimes known as C/KT because noise is measured as KT or Boltzmanns constant K multiplied by the noise temperature T.
This picture shows a signal displayed on a spectrum analyser. The signal is at a frequency of 6.5 GHz as it is in the center of the screen and the center frequency of the analyser is 6.5 GHz. Each square of the display is a division, the analyser is set to 5 dB/DIV which means that each square is 5 dB. The resolution bandwidth (RBW) is set to 10 KHz which is the width of the sweep filter inside the analyser. 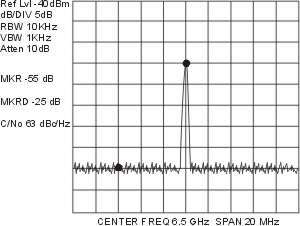 This filter is swept across the frequency span defined by the SPAN of the analyser, in this case 20 MHz. The RBW defines the amount of power captured by the analyser and displayed on the screen as a signal. Having an RBW to narrow will not capture all of the signal and will result in a less accurate display. In order to measure the C/No we first multiply the Log of the RBW by 10. Next we add the size of the signal which is 5 squares or 25 dB. 40 dB + 25 dB = 65 dB. Now because of an inherent error using this method we must subtract 2 dB. 65 dB - 2 dB = 63 dBc/Hz. This gives us a fairly accurate C/No of 63 dB (carrier power) in 1 Hz bandwidth.